With the frosting on these cupcakes you might blow over the limit (no you won’t but just don’t drink anything and drive as a rule) 😉 Lovely and boozy, your guests will keep going back for more. Preheat oven to 190C (170C if you have a fan oven like mine). Beat the butter until fluffy without anything else in it. Beat the sugar into the butter until you can’t see sugar anymore. If your butter was at room temp and whipped before this should be easy. Add the vanilla extract and beat in lightly. Beat the egg into the mixture. I usually beat the egg slightly first in the bowl I’m using, then incorporate it into the mix using a hand blender but you don’t have to. Sift the flour and salt together into the mixture carefully and fold in. Add the Bailey’s to the mixture and beat. Don’t overbeat the mixture at this point. Spoon around 60g of mix into the cupcake papers. Bake in the preheated oven for 20 minutes or until risen and a skewer comes out clean. While they are baking make the frosting by beating softened butter until whipped then add the icing sugar slowly and fold in to avoid too much spray. 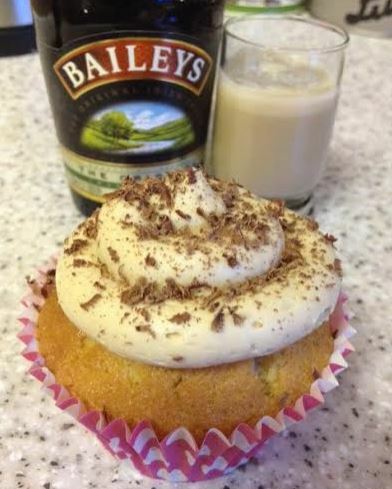 Add Bailey’s into the icing sugar mix while still adding icing sugar to help dampen as well. The idea is to avoid the spray of icing sugar. 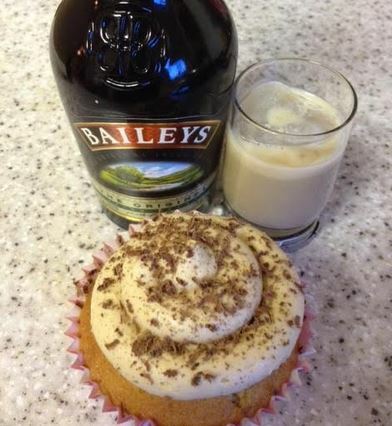 Once cooled top with Bailey’s frosting and ENJOY!